The Canadian photographer Edward Burtynsky (b. 1955) became world-famous with his breathtaking large-format photographs documenting landscapes altered by human hand, industrial terrains and urban agglomerations. His works are on show at the Solomon R. Guggenheim Museum, the National Gallery of Canada and the Bibliothèque Nationale de France. Burtynsky is concerned with natural landscapes exposed to constant threat and profound damage by climate change and oil spills. In his intensive work processes, he creates wide-ranging thematic series which bring out the destructive power of humanity and its effects in and on the natural world. These are not preachy photographs, but highly penetrating documents that need no words by way of explanation. His major motif cycles include ‘Oil’ (2009), ‘Quarries’ (2007), ‘China’ (2005), ‘Aqua Shock’ and currently the large-scale project ‘Anthropocene’, which he is due to complete in the course of 2018. His large-format photographs are fascinating by dint of their aesthetic beauty, but also frightening if we regard them as visible signs of manmade destruction and the massive plundering of nature. 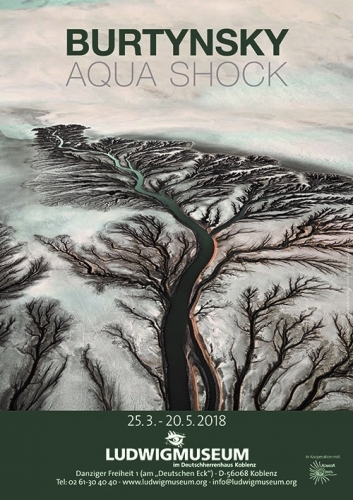 On display are examples from his recent series ‘Aqua Shock’, for which Burtynsky crisscrossed five continents to explore extreme ecological situations and to record not only the reserves, but the use, distribution and waste of water. He reveals the dangers that lie in the ongoing exploitation of water resources. In his own words: ‘I wanted to trace the evidence of global thirst and threatened sources. Water is part of a pattern I’ve watched unfold throughout my career. I document landscapes that, whether you think of them as beautiful or monstrous, or as some strange combination of the two, are clearly not vistas of an inexhaustible, sustainable world.’ – Edward Burtynsky (Walrus, October 2013).